Are you looking for J & K Bank Admit Card 2019? If Yes it is the right place for you. Jammu and Kashmir Bank Department will organized written examination for Probationary Officer & Banking Associate Posts. Candidates may require JK Bank Hall Ticket 2019 for participating in an examination. The Examination for PO Posts will be held on 22 April 2019 and Banking Associate exam will take place on 23, 24, 25 April 2019. Applicants who are going to participate in JK Bank examination should download their J & K Bank PO Call Letter before the examination. For further more details regarding JK Bank PO exam read below article carefully. 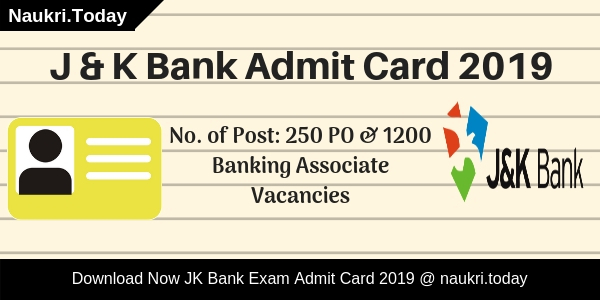 Fresh Update as on 13.04.2019: Applicants those will be appearing in PO Exam can download the JK Bank Admit Card 2019 from here. The Department has breleased the official link to download the JK Bank PO Call Letter 2019. You can check the official link for downloading it. Fresh Updates as on 08.03.2019: Dear Participants, Jammu & kashmir Department has released eexam date for Probationary Officer & Banking Associate Exam. The written examination will be held on 22, 23, 24, 25 April 2019. The Department will release JK Bank Admit Card 2019 before one week of examination. Here we provided you links to download it. Links are not active yet. 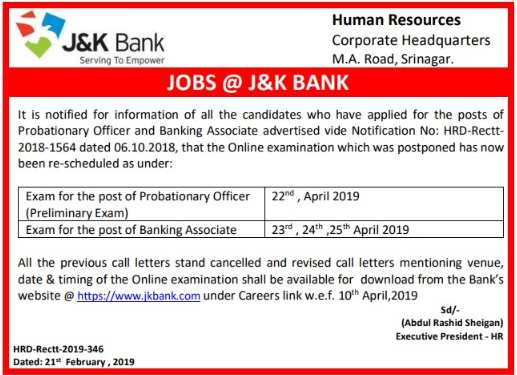 Fresh Updates as on 27.02.2019: Hello Friends, JK Bank is going to conduct written examination for PO & Banking Associate Posts on 22, 23, 24, 25 April 2019. Candidates may download their J & K Bank Admit Card 2019 from links given here. The Department will release JK Bank Call Letter 2019 before 10 to 15 days of examination. Fresh Updates as on 21.02.2019: Dear Participants, J & K Bank has postponed PO & Banking Associate Examination due to some reasons. Now The examination is going to held on 22nd, 23rd, 24th, & 25th April 2019. Here we provided you links to download J & K bank Admit Card 2019. Candidates should stay connected with us for more latest updates. 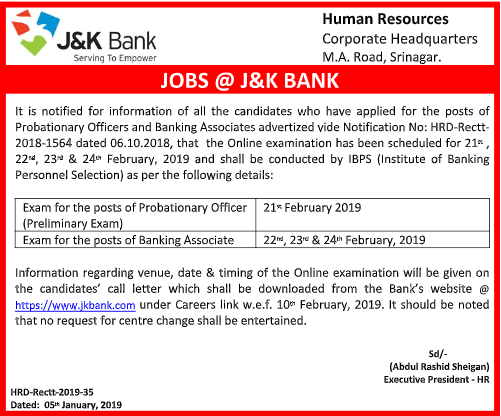 Fresh Update as on 20.02.2019: Hello Frineds, We are here to remember you that JK Bank Probationary Officer Examination will be held on 21st February 2019. Candidates who do not download their J & K Bank Admit Card 2019 till now, may download from links given here as soon as possible. Banking Associates Exam will be held on 22nd, 23rd, & 24th February 2019. Candidates do not forget to carry JK Bank Hall Ticket 2019. Jammu and Kashmir Bank Limited has issued notification for Probationary Officer Posts. The Department is going to conduct written examination for appointing candidates on 250 vacancies. Online Registration for JK Bank PO Jobs has started from 20 October 2018. The Last date for registration is 06 November 2018. An examination will take place in two parts such as Preliminary and Mains Exam. Qualify applicants will participate in Interview. To take part in examination candidates need to download J & K Bank Admit Card 2019. The Department will release JK Bank Hall Ticket before 10 to 15 days of examination. Here we provided you links to download JK Bank Call Letter 2019. 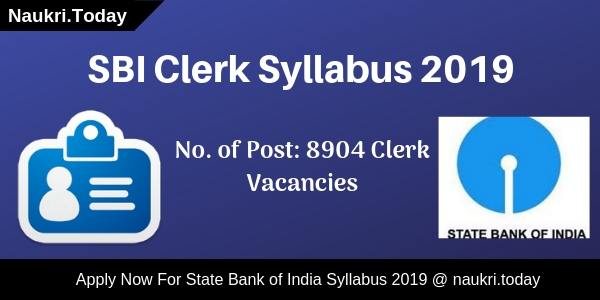 Candidates do not forget to carry J & K Bank Call Letter 2019 at the exam center. 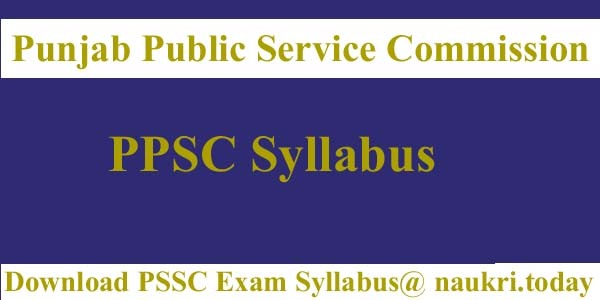 It is a very important document as per the exam point of view. The Invigilator will not allow you to sit in the examination hall without JK Bank Admit Card 2019. It contains a lot of important details related to the examination. Applicants must download J & K Bank Hall Ticket 2019 from links given here before an examination. Participants can download their JK Bank PO Call Letter by Registration Number or ID Password. Here we provided you a list of information present on J & K Bank Admit Card 2019. Exam Date and Timings, etc. Applicants may also carry one ID Proof along with them at the exam center. ID Proof is used for attendance process and identity verification. Aspirants may also take two passport size photo and one copy of ID Proof. Candidates may download J & K Bank PO Admit Card 2019 before an examination. Check here a list of ID Proof that you can carry at the exam center. Applicants should download JK Bank PO Hall Ticket 2019 by Reg. Number or ID Password. Candidates should follow these steps which may help you to easily download J & K Bank Call Letter 2019. Log on to Official Website of Jammu & Kashmir Bank i.e jkbank.com. Now Search for JK Bank Admit Card section at Homepage. After that enter your Reg. Number or ID Password. Now your J & K Bank Admit Card 2019 will appear on your screen. Check your Exam center or Date. Do not forget to check Exam Timing. Candidates must carry it at the examination hall. Conclusion: J & K Bank is going to conduct the PO & Banking Associate Preliminary examination in April 2019. Applicants who are going to participate in the examination must download J & K Bank Admit Card 2019 from here. The J & K Bank PO Call Letter is available here or official site very soon.